As for the Master Year 1, the Master Year 2 programme is half-composed of theoretical training (the course modules) and practical training (the research project). The Master Year 2 trainee must successfully complete the theoretical and the practical trainings to be awarded the Eu2P Master in Pharmacovigilance and Pharmacoepidemiology. For this second year of Master, the trainee is invited to choose a specialisation track that fits current or future professional needs. The Eu2P Master programme is delivered by the Eu2P Academic Partners lecturers and experts from the 2 regulatory agencies and 15 industry partners belonging to the Eu2P consortium. 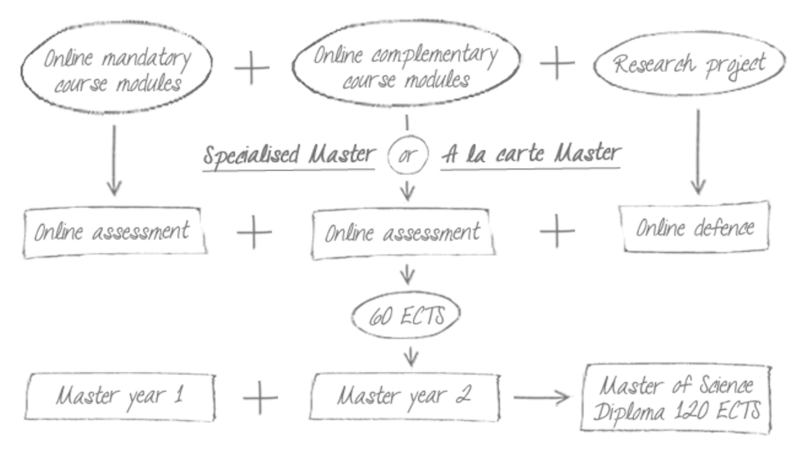 Two teaching scenarios are proposed to the Master Year 2 trainee: "Specialised Master" vs "A la carte Master"
Each scenario must include enough course modules to validate a total of 30 ECTS credits on full-time or on part-time pace (i.e. in one or two years duration). This choice aims to provide a broad knowledge of all Master specialisations. This track is composed of four modules of your choice among the Master specialisations. Complementary modules have to be selected among the remaining modules to overall validate 30 ECTS credits. Clinical and pharmacological principles Pharmacovigilance regulations Principles of identifying and recognizing adverse events and safety signals Introduction to benefit-risk assessment and pharmacoeconomics in decision making Drug utilisation studies: introduction and quantitative methods Information and communication about benefit-risk of medicines. Basic principles. Each course module is appraised through continuous and/or final assessment. The master Year 2 trainee must at least obtain the "pass" grade in each module, whether their course modules are mandatory or complementary. The Master Year 2 trainee must at least obtain the overall "pass" grade for the research project to validate the practical training part of the Master second year programme. - Patients, physicians, information and prescribing. - Clinical and pharmacological basis of therapeutics. - Variability in medicines response. - Therapeutics and medicines prescribing of medicines for selected health problems. - Scientific methods and causality. - Statistical and methodological issues for the design and analysis of clinical trials. - Ethical issues in the development of clinical research and clinical trials. - Systematic review and meta-analysis of randomised clinical trials. - Other methods for the evaluation of the effectiveness of medicines and therapeutic interventions. - Randomised clinical trials limitations. - Evidence-based medicine and its limitations. - Critical appraisal of randomised clinical trials limitations. - Critical appraisal of a meta-analysis of randomised clinical trials. - Quantitative measures of drug utilisation. - Sources of data and standards to compare with. - Data generalization: from particular cases to population impact-2. Examples of the value of observational studies and meta-analyses of observational studies in the evaluation of the public health impact of medicines use. - The importance of the denominator: case-population studies. The future of pharmacovigilance. - Hepatitis B vaccine in France, pandemic influenza vaccines, HRT and cancer. What can we learn? What could have been done? - Communication aspects based on drug withdrawals: e.g. rofecoxib, rosiglitazone, benfluorex. What can we learn? What could have been done? To develop a robust knowledge and familiarity with the methods used in clinical research and pharmacoepidemiology to evaluate the efficacy and effectiveness of medicines and therapeutic interventions. To develop a robust knowledge and familiarity with the methods used in randomised clinical trials. To analyse and discuss ethical and legal issues in clinical research and randomised clinical trials. To understand principles of synthesizing scientific data through systematic review and meta-analysis of clinical trials. Statistical and methodological issues for the design and analysis of clinical trials. Ethical issues in the development of clinical research and clinical trials. Systematic review and meta-analysis of randomised clinical trials. Other methods for the evaluation of the effectiveness of medicines and therapeutic interventions.